The FJM Security cam lock with collar ring brings an added layer of security to any cam lock application. The stainless steel collar ring will stand up to harsh weather conditions and shroud the head of the cam lock. This prevents attacks on the cam lock from those who would try to pull off the cam lock with pliers, wrenches or other tools. The collar ring is independent of the lock – if anyone attempts to twist the collar ring, the lock itself will not move. The stainless steel collar ring gives any cam lock a more robust look that can be enough to deter any intrusion from an outsider. The locks are keyed different – each key fits a different lock. 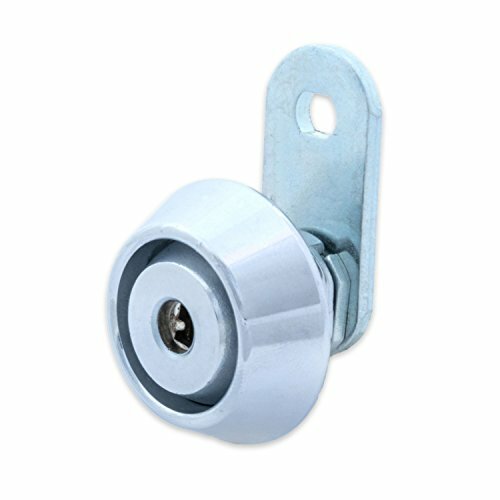 This European style cam lock with the stainless steel collar ring has a 7/16” cylinder length and can accommodate material thickness up to 3/16" thick. It features a high security keyway with two very unique keys that are difficult to duplicate. The stop cam on the weather proof cam lock is reversible so that the lock key can either be turned to the right or left to open. The cylinder diameter is standard at ¾”. The high security lock is constructed of zinc alloy and chrome plated. The hex nut, cam, screw and keys are all steel with chrome plating. If you have any questions about this product by FJM Security, contact us by completing and submitting the form below. If you are looking for a specif part number, please include it with your message.